In the aftermath of the Mumbai terror attacks, the question that everyone is asking is ‘Why’. India already claims it has evidence of Pakistani hand. On Friday, Prime Minister Manmohan Singh had made a stern call to Pakistan and had asked them to send the head of its intelligence agency, the ISI, to India. However, Pakistan has refused to do the same. QUES: Do you think the attack on Mumbai was planned to de-stabilise the conciliatory efforts of the Indian and Pakistani governments? Ahmed Rashid: I think the attacks were strategically planned by al-Qaeda through the Lashkar-e-Toiba (LeT) militants they train. It is trying to work out a space for itself in the Federally Administered Tribal Areas (FATA). They have been hurting very badly in there because of pressure from the Pakistani army and US missile attacks. QUES: What is the objective? Ahmed Rashid: It is a military strategic objective to get the army out of Bajour and stop the US from stepping in. If tensions between India and Pakistan escalate, the army will be moved to the Indian border, as happened in 2002. After the attacks on the Parliament House in Delhi, India built up troops on the border. Pakistan responded by moving its army from the Afghanistan border to the Indian one. And al-Qaeda had a free run of FATA. They are looking to repeat the exercise. QUES: Do you think they are likely to succeed? Ahmed Rashid: The danger is the escalation of India-Pakistan accusations. They should not fall into the al-Qaeda trap. The Indian Government has already jumped the gun a bit. It is a weak government and is under pressure to do something. QUES: What would happen if the Indian and Pakistani governments see through the trap? Ahmed Rashid: Then there will be more attacks in Pakistan. This is a very critical period for al-Qaeda. It has only a few months. The US is preparing to send 20,000 troops into Afghanistan by April. The al-Qaeda is under tremendous pressure. They need to do something. QUES: Will the new government in Pakistan be able to genuinely change the relationship with India? Ahmed Rashid: It is a weak civilian government, just like the Indian Government. It is a Government that is besieged by a collapsing economy and tensions with the army. But it has its heart in the right place. The army needs to come under a democratic government for the outlook on national security to change. Dinesh Narayanan is Associate Editor at the new business magazine to be launched by Network 18 in alliance with Forbes, USA. Home Minister Shivraj Patil, under tremendous criticism over a spate of terrorist attacks in the country since last year, resigned on Sunday in the wake of the Mumbai Terror strikes. Patil, who had offered to step down at the Congress Working Committee (CWC) meeting last night, sent his resignation to Prime Minister Manmohan Singh this morning, sources said. The 74-year-old Patil was inducted into the Union Cabinet despite his defeat from Latur in Maharashtra in the 2004 Lok Sabha polls and has been a target of the opposition as also the detractors within the party over his handling of the internal security situation in the country. Patil had told the CWC meeting that as the Home minister he “takes the responsibility and whatever the CWC decides, I am ready to do”, the sources said. Patil’s remarks came in the wake of criticism by several leaders, including Union Ministers P Chidambaram, Kamal Nath, Kapil Sibal and H R Bhardwaj, they said. The refrain of these leaders at the meeting was that a strong action is needed in the wake of the Mumbai terror strikes and accountability has to be ensured at the higher as well as lower levels. Patil, who has been in public life for over four decades, was brought into the Manmohan Singh Cabinet as he was considered a complete Gandhi loyalist and Sonia Gandhi had turned down repeated demands for his ouster from the government. Patil was also one of the serious candidates of the Congress for the post of the President last year after the tenure of A P J Abdul Kalam got over. 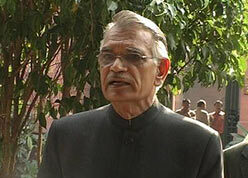 But, the Left parties, which were supporting the Government from outside, had put their foot down on such a proposal. Besides Patil, Maharashtra Chief Minister Vilasrao Deshmukh, who was also present at the meeting, came under attack on the terror strikes issue, CWC sources said. The leaders who voiced criticism on the issue included union ministers P Chidambaram, Kamal Nath, Kapil Sibal and H R Bhardwaj, they said. The refrain of these leaders at the meeting was that strong action is needed in the wake of the Mumbai terror strikes and accountability has to be ensured at the higher as well as lower levels. This prompted Pranab Mukherjee to remark that since it was collective responsibility of the Cabinet, he would also like to take responsibility as the External Affairs Minister. Maharashtra Chief Minister, however, chose to ignore the criticism and instead apprised the meeting of the steps taken by his government in the wake of terror strikes, they said. The Home Minister as also National Security Adviser M K Narayanan came under attack at the CWC meeting called hours after the security operations against the terrorists was indication enough that the leadership was planning some strong steps. Did some Mumbai locals provide support to the Pakistani terrorists? Azam Amir Kasab, the only Pakistani terrorist nabbed alive, has revealed names and addresses of at least five people from the city who helped the terror operation. Kasab has told police that they were sent with a specific mission of targeting Israelis to avenge atrocities on Palestinians. This was why they targetted Nariman House, a complex meant for Israelis. Sources said Kasab’s colleagues killed in the operation had stayed in Nariman House earlier. “They have stayed in Nariman house on rental basis identifying themselves as Malaysian students.” said a source. Police are trying to find out how Nariman House rooms were given to non-Jews. Police has taken all the records books of for verification. The second target was the CST railway station because casualties would be high. Crime branch has also recovered several fake identity and credit cards from the belongings of dead terrorists. “All the cards are in different names and of different banks. Now we are at least trying to figure out how they procured credit cards from various banks.” said Maria. The recovery of so many cards with different names have led Mumbai police to suspect the involvement of ISI. Though Maria maintained only 10 terrorists had sneaked in, the two blasts in taxis in Wadi Bunder and Vile Parle have led the police to believe there could be possibility of the presence of another two or more terrorists in the city. 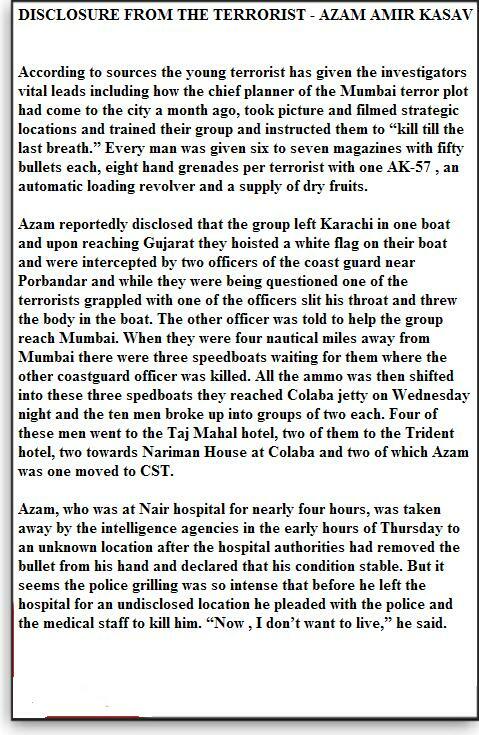 Azam Amir Kasav is the only terrorist from the Mumbai terror attacks that survived. He was captured and has been interrogated, providing a great deal of information about the attacks. 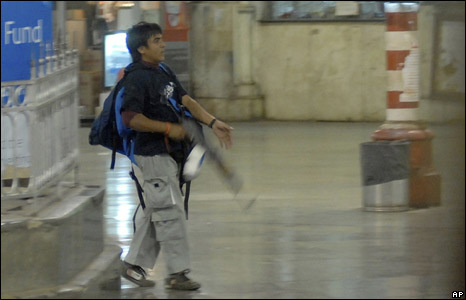 Azam Amir Kasav, also known as Mohammad Ajmal Mohammed Amin Kasab, looked confident in the photo above. It was taken as he walked into the Mumbai train station (CST) with the intent of killing as many people as he could. He and his partner finished their business at the station and moved on to their next target, Girgaum Chowpatty. They were stopped and engaged in a gun fight by police. Azam killed assistant police inspector Tukaram Umbale before he was shot. His partner was shot and killed during the gun battle. Azam played dead and the bodies of both men were picked up to be transported to the hospital. At some point, the police realized that Azam was breathing. When the 21-year-old Azam arrived at the hospital he begged the medical staff there to help him. He told them that he didn’t want to die. It turned out that he was fluent in English and from from tehsil Gipalpura in Faridkot in Pakistan. He begged for his own life after indiscriminately taking the lives of whoever happened to be in the train station that morning. After Azam’s bullet wound was treated, he was taken away by interrogators. Its reported that at first he was tight lipped, but it didn’t take long for intense questioning to loosen him up. 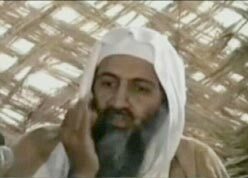 Apparently, he has given investigators some vital information about the planning of the Mumbai attacks. He has told investigators that their plan was to blow up the Taj Hotel and they had enough explosives to do it. They wanted to create an Indian 9/11. Taking the decidedly uncomfortable premise of a man hooking up with his brother’s girl, Sorry Bhai is a brave little film that puts a fresh spin on the tale. Bumbling younger brother Sharman Joshi arrives in Mauritius with his parents Shabana Azmi and Boman Irani to attend elder brother Sanjay Suri’s wedding, and ends up falling in love with his brother’s fiancée Chitrangada Singh. The triangle that ensues involves Sharman, Chitrangada and – no, not Sanjay who seems to wisely move on – but the boys’ overbearing mother Shabana who gets herself irreparably entangled in this awkward mess. At the very core of Sorry Bhai’s drama is the magnificent Shabana Azmi who takes her role and immediately sinks her teeth into it, constructing a character that is all flesh-and-blood. From the little moments – like the one in which she follows Sharman and Chitrangada into the woods, only to hurt her foot before she can confirm her suspicions – to the significant ones (which include her clashes with her daughter-in-law to be), Shabana is always on the ball, and makes her character omnipresent in the movie, even when she’s not physically around in every frame. A word of praise also for the immensely gifted Boman Irani who has a tougher job at hand – making a solid believable person out of what was probably a three-line character sketch on paper. Boman adds the right comic touch and just the perfect hint of melancholy to create an affectionate lug of a father who speaks less but delivers gems every time he does. The plot of Sorry Bhai may be simplistic, but the film is not so much about the plot as it is about the characters, and director Onir does a fine job of writing complex, flawed characters who don’t come with any easy answers. Chitrangada’s character, for one, is a tough nut to crack – why does she appear almost unaffected when Sanjay puts off their wedding to attend to a pressing business commitment; why does she suddenly decide to pursue Sharman with such dogged determination; does she really feel no responsibility to Sanjay for what’s just happened? These are important questions all, but the answers are hard to find. Much like life, if you think about it. Of the three leads, Sharman Joshi plays his part with such sincerity, you’re willing to look at his flawed character with renewed sympathy. The radiant Chitrangada Singh is awkward in places, but puts up a good show nevertheless, especially in her scenes with Shabana. Sanjay Suri, despite the weak characterisation, does the best he can with his role, in particular nailing the film’s one defining scene in which Sharman makes the big confession, to which he responds with shock, anger, and even a little affection. Sorry Bhai is not devoid of faults – the film occasionally gets too talkie, and in some places a little silly too – but the film’s real charm lies in those memorable moments the director creates between his two favorite players – Shabana and Chitrangada. That’s the reason to watch this film. I’m going with three out of five for director Onir’s Sorry Bhai. It’s a strong character-driven drama about imperfect people trying to find their own happiness in the world. Don’t miss it. Amitabh Bachchan has pulled out his revolver many a times on screen. This time he has pulled out the revolver again, but not to shoot anyone on screen but to defend himself and have a safe sleep. He says, ‘Last night, as the events of the terror attack unfolded in front of me I did something for the first time and one that I had hoped never ever to be in a situation to do. Before retiring for the night, I pulled out my licensed .32 revolver, loaded it and put it under my pillow. For a very disturbed sleep,’ the megastar wrote on his blog. ‘My pain has been the sight and plight of my innocent and vulnerable and completely insecure countrymen, facing the wrath of this terror attack. 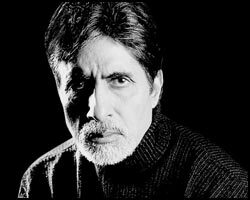 And my anger has been at the ineptitude of the authorities that have been ordained to look after us,’ Big B expressed in his blog. Bachchan was disgruntled over the cliche ’spirit of Mumbai’ which he said people were using to cover the traumatic experiences that the merry city underwent in recent years. Bachchan says he bows over this and wishes the spirit never ends. We too agree with you Mr. Bachchan. Sleeping with a loaded gun under the pillow is a very dangerous thing to do. Even with utmost precaution accidents do happen. I pray to God that the gun does not go off accidentally. Otherwise a national embarrassment will turn into a national martyr. Years ago one accidental hit in the stomach (and Indira Gandhi) erased his poor track record and turned him into a star, and now it seems Big B is trying is erase his shoddy legacy and flop status, and turn into a national martyr. Poor Big B is always looking for short cuts, genuine hard work is an alien concept to him. HYDERABAD: The Board of Intermediate Education has released the revised time table for the first and second year final examinations to be held in March 2009. The examinations would be held from 8 a.m. to 11 a.m.
Oye Lucky Lucky Oye Movie Review– More like a docudrama on the life-story of a thief. Dibakar Bannerjee, won millions of hearts and received worldwide appreciation for his first movie, ‘Khosla Ka Ghosla’. So his next venture was eagerly awaited by comedy lovers as well as lovers of quality cinema. His present offering showed good vibes with its promos and catchy theme of life of a famous thief. But surprisingly, Dibakar chooses to go with a Documentary film-making style in “OLLO”. The movie is like a biography of a thief, an account of his childhood and youth, about his various relationships and how he manages to escape each time he is caught by the police. Dibakar, though not Punjabi by birth, does has a soft corner about Sikhs and Punjabi culture. His first movie had a Punjabi culture feel allover and the same is more evident in this one two. In fact in OLLO he even casts a teenage Sikh boy to play the role of young Lucky. The movie opens with the childhood of lucky. The boy (young Lucky) is well chosen and shows great confidence. It never seems to be his first movie as he is so convincing in his act. The opening scenes between him and Paresh Rawal (his father) are a treat to watch. In simple words this part of the movie showing his start as a thief, his teenage love and fights is the best portion of the movie. After this section, enters Abhay Deol with his cute smile and cool attitude. Here I have to say that Abhay is one of the most under-rated actors Bollywood has. His choice of films clearly shows his class cinematic thought process and he deserves praises for that. As Lucky he just floats calmly and impressively in the skin of a famous thief. He again gives a superlative performance as the famous conman of Delhi. Paresh Rawal in a triple role is competent but sadly has very less comic scenes. His best shows in his role of a Vet doctor who becomes partner with lucky for opening a new restaurant. Neetu Chandra is also impressive with her subtle persona. Archana Puran Singh shows excellent timing for which she is known for. Another worth mentioning act comes from the actor who plays Lucky’s close friend. He is top rate and also gets excellent one liners which entertain the most. But despite having talented actors, brilliant performances and bright direction, the film lacks on the part of entertainment. The movie only tells you the story of a thief, but doesn’t entertain the viewer. It doesn’t have fast unexpected turns in the story. The narration gets repetitive post interval and you know what is going to happen next. Though portrayed as a comedy, the movie doesn’t have enough comic scenes. The funny chemistry is missing which was strongly there in “Khosla Ka Ghosla”. While watching it, you can smile at certain scenes but a hearty laughter would be difficult. Dibakar sticks to his choice of realistic topics, having real life inspirations and also again selects Delhi for his backdrop of the story. Its nice to see that atleast he is deriving inspiration from the real life happenings around him and not copying ideas from the English flicks. His present idea of a movie on a famous conman was also interesting and had potential of becoming an interesting movie. Sadly it only remains interesting to a certain section and lacks the expected entertainment factor, which goes against the movie. Instead of coming out as an entertaining movie on robberies and chases, OLLO is more like a docu-drama on the life of a famous thief. There is a very limited section of viewers who will find it good enough. People in Delhi Punjab and North territory can relate to it in a better way. Dibaker is surely a director to watch out for and I am waiting for what he plans next. He also knows one thing for sure and that is not to put any song in the script if not needed. So this is another song-less movie from him, which is intelligent on his part. But one thing I would surely like to request to our film-makers here – Do give a worth watching role to Abhay Deol, the boy has got a hidden talent to explore. So to end, “Oye Lucky Lucky Oye” is an interesting movie with a touch of difference but don’t expect a great comedy out of it. A Wal-Mart worker was killed Friday when “out-of-control” shoppers desperate for bargains broke down the doors at a 5 a.m. sale. Other workers were trampled as they tried to rescue the man, and customers shouted angrily and kept shopping when store officials said they were closing because of the death, police and witnesses said. Nassau police said about 2,000 people were gathered outside the store doors at the mall about 20 miles east of Manhattan. The impatient crowd knocked the man, identified by police as Jdimytai Damour of Queens, to the ground as he opened the doors, leaving a metal portion of the frame crumpled like an accordion. Damour, 34, was taken to a hospital, where he was pronounced dead about 6 a.m., police said. The exact cause of death has not been determined. A 28-year-old pregnant woman was taken to a hospital, where she and the baby were reported to be OK, said police Sgt. Anthony Repalone. Police said criminal charges were possible in the case, but Fleming said it would be difficult to identify individual shoppers. Authorities were reviewing surveillance video. Wal-Mart Stores Inc., based in Bentonville, Ark., called the incident a “tragic situation” and said the employee came from a temporary agency and was doing maintenance work at the store. Shoppers around the country line up early outside stores on the day after Thanksgiving in the annual bargain-hunting ritual known as Black Friday. It got that name because it has historically been the day when stores broke into profitability for the full year. ISLAMABAD, Pakistan — The bombing and machine gun attacks in Mumbai demonstrates how terrorism has affected Asian nations hosting sporting tours and places the global future of cricket in jeopardy. Pakistan, hit by a spate of bombings, will finish 2008 without playing a single cricket Test. Sri Lanka’s civil war involving the Tamil Tigers has been going for more than 25 years and shows no sign of abating. Now, more than 119 people in Mumbai are dead in India’s worst terror attack, causing the England cricket team’s tour to be suspended and threatening a sport in a region containing four of the nine Test-playing nations. The other five countries with the International Cricket Council’s elite Test status – Australia, England, New Zealand, South Africa and West Indies – have recently demonstrated their reluctance to visit the subcontinent, and the future of the sport could be bleak if that continues. Hundreds of people have died in Pakistan this year due to suicide bombings, forcing the ICC to postpone the biennial Champions Trophy – the second most prestigious limited-overs tournament after the World Cup – from September to a date still to be decided. “You want cricket to be played in all parts of the world and that has been the problem with Pakistan, you haven’t been able to tour there because of the volatile country,” New Zealand captain Daniel Vettori said. Vettori fears that Test cricket could be restricted to being played in only a few countries if the security situation doesn’t improve. The concerns have even forced the Pakistan Cricket Board to consider staging a series against India at a neutral venue in January. Syed feels subcontinental nations should focus on ensuring they play each other at home, and forget about convincing non-Asian countries that the region is safe. “The only way I see the game progressing in subcontinent is that at least the bilateral series between the subcontinent teams be played in the respective countries,” said Syed, who has also worked as a development manager for the Asian Cricket Council. The terrorist attack has also caused the postponement in India of the inaugural Twenty20 Champions League tournament that involves the top five provincial teams in the world. Australia opening batsman Matthew Hayden, who plays for the Chennai Super Kings in the Indian Premier League and was due to compete in the Champions League, said if the tournament was cancelled that it would be a “huge loss” for international cricket. “But the impact is minor compared with the social and economic impacts that it will have on India,” Hayden said. Australia captain Ricky Ponting backed the event to be held elsewhere after Cricket Australia’s decision to stop all travel to India. Cricket Australia chief executive James Sutherland expected Mumbai’s terrorism attack to cause a similar tightening in security to that which followed the Sept. 11, 2001, attacks on the United States. “Cricket will go on. It doesn’t mean that we will cut any corners in making decisions,” Sutherland said Friday. “Everything is going to be more rigorous. That’s what we saw in the world following 9-11 and that’s what is going to come as a consequence of this. Pakistan coach Intikhab Alam wants the cricket boards to get together to restore confidence, but acknowledges there is little it can do in the short term. “It’s a matter beyond the control of respective cricket boards after what happened in Mumbai,” he said. Former Sri Lanka captain Hashan Tillakaratne has a similarly forlorn outlook on the sport’s future.